The Cast of A Day by the Sea. Photo by Richard Termine. BOTTOM LINE: A first-rate revival of a forgotten gem of a play from the 1950s. English playwright N.C. Hunter’s career reached its pinnacle in the 1950s, but his decline came halfway through that decade when John Osborne and the “Angry Young Men” playwrights made their way onto the scene and were hailed by critic Kenneth Tynan as the new voices of the British Theatre. Interest in plays like Hunter’s waned and, after contributing several thoughtful and poignant plays that featured the likes of Sir John Gielgud, Hume Cronyn, and Jessica Tandy, Hunter died in 1971, underappreciated and underrated. A common refrain from critics that hastened the demise of his career was the repetitive comparison of his work to that of Chekhov’s. 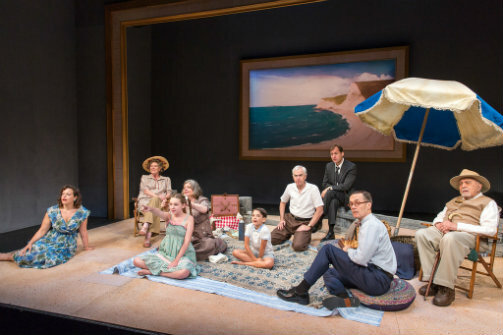 While the similarity may have seemed derivative and passé in the 1950s, it is what I most enjoyed about the Mint’s current revival of A Day by the Sea. Hunter’s similarity to Chekhov is uncanny, and I mean that as a compliment of the highest order. Being compared to Chekhov is not a bad thing, especially if you happen to be every bit as eloquent, funny, and brilliant—and indeed N.C. Hunter was. At the center of the play is Julian Anson (Julian Elffer), a circumspect diplomat annoyed that he is spending the day in the country with his family attending to domestic affairs. His mother Laura Anson (Jill Tanner) has invited newly widowed Frances Farrar (Katie Firth), who was raised on the estate, and her children (Kylie McVey and Athan Sporek) back for the summer in the hopes that her son will take an interest in the newly eligible bachelorette. Julian couldn’t be less interested until he learns that things at work are not going quite as well as he estimated. A Day by the Sea is not a fast-paced, keep-you-guessing plot of twists and turns. It is an exquisitely detailed character study of the Anson family and friends. As with Chekhov, it is the subtleties and nuances that reveal profound depth, deep human fears, and highest hopes. And like Chekhov, Hunter reveals these details with tremendous humor, each character appearing as utterly ridiculous as we have all been made to feel at one time or another. The play makes the point that no matter how smart, or cautious, or responsible, or hardworking, or earnest or well-intentioned we may be, life always finds a way to sabotage our efforts and make us appear foolish. Under the direction of veteran director and actor Austin Pendleton, this ten-person ensemble realizes the play to its greatest potential. With sets by Charles Morgan, costumes by Martha Hally, and lighting by Xavier Pierce, the design elements unify the production with elegance. This play is a lost treasure-trove of exquisite writing filled with hilarity, awkward interpersonal moments, and highly intelligent observations about life. All of this is offered via a beautifully eloquent text that earns its place in the category of great dramatic literature. It is a crying shame that such a rich and satisfying play has been kept away from audiences for nearly six decades. But the Mint Theater Company is doing New York audiences a great service by allowing them to rediscover this gem. 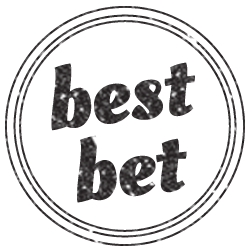 Their mission is to create a new life for lost and forgotten plays from the past. They fulfill that mission in spades with this production, and I, for one, am very grateful to them. A Day by the Sea is by N.C. Hunter. Directed by Austin Pendleton. Set Design is by Charles Morgan. Costume Design is by Martha Hally. Lighting Design is by Xavier Pierce. Sound and Music by Jane Shaw. Props by Joshua Yocom. Stage Manager is Catherine Bloch. Assistant Stage Manager is Arielle Goldstein. The cast is Curzon Dobell, Julian Elfer, Katie Firth, Philip Goodwin, Sean Gormley, Polly McKie, Kylie McVey, George Morfogen, Athan Sporek, and Jill Tanner.